"The Street With No Name" in Levenshulme, which sadly isn't on the list because it doesn't actually have a name. 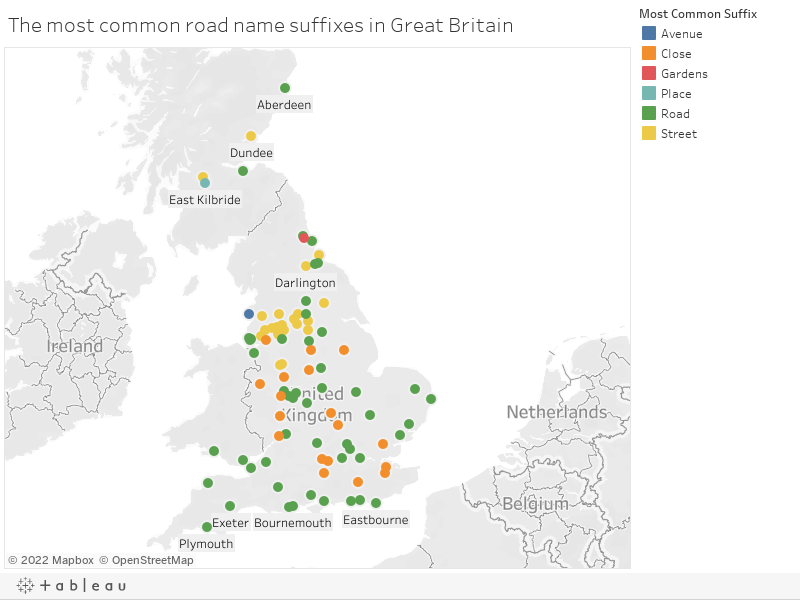 1) There are about 790,000 roads with names in England, Scotland and Wales. The Ordnance Survey Open Names database lists 788,340 roads with a name, from Aachen Way in Halifax to Zurich Gardens in Bramhall. But only a fifth of roads (about 160,000) are called “Something Road”: 15 per cent are Closes, 10 per cent are Streets, 8 per cent are Lanes and 6 per cent are Avenues. ...of which there are 2,453. Followed by Station Road (2,023), Church Lane (1,868), Church Street (1,521) and Mill Lane (1,318). This finally, conclusively proves that trains are better than Jesus AND mills. Congratulations, “Bolderwood Arboretum Ornamental Drive”: you did it! Rye, a road in the village of Puriton in Somerset, unexcitingly named after the green thing it runs past. It does, debatably, have some competition: the MediaCity complex in Salford is so trendy that it has colours instead of road names, which means there’s a road listed under the name “Red” in the Ordnance Survey database. There’s also an “Alt” in Widnes but that’s an abbreviation for “Alternate” which is a very normal thing to name a road. Good job, Widnes. As noted in CityMetric only last week, the City of London may be the most famous example of a place with “no roads” (i.e. no roads named Somethingorother Road; although sadly this is no longer technically true, curse your eyes, Goswell Road). One posited explanation is that incorporating the word Road into a road name is a modern enough concept that the layout of the City predates it. In Milton Keynes, only 4 per cent of named roads are Roads. When the town was laid out in the 1960s it was decided the horizontal roads of its innovative grid system would be Ways, and the vertical roads Streets: but the majority of the roads are actually the smaller suburban Closes, Courts, Places & Drives that lie within the box of each grid. No, this is very interesting actually. Roads that run one way are A Avenue, B Avenue, C Avenue, D Avenue, E A… you get the idea. Roads that run the other are 1st Street, 2nd Street and so on. I'm coming up, so you better get this party started! For example, “Place” is the most common suffix in East Kilbride, appearing in 17 per cent of road names. It’s also in more than 10 per cent of the road names of Edinburgh, Glasgow, Aberdeen and Dundee. There are more Streets than Roads in much of the North: Oldham and Burnley are more than 45 per cent Street. Meanwhile on the south coast, Bournemouth only has one. And it’s not even a very good one. Orchard Street in Bournemouth. Cowabunga! Image: Chris Downer/Geograph/creative commons. What’s up, Blackpool? What did you do with all the trees? Maybe that’s what the Gates are for!!!!! HA HA. But there are 595 “The Street”s and 578 “The Avenue”s. What a creative island we are.